The TRIRADIUS in a fingerprint: how it develops, it's characteristics + a definition! Re: The TRIRADIUS in a fingerprint: how it develops, it's characteristics + a definition! Lynn wrote: thanks for patient explanation Martijn. Where did you get all these different defnitions from? 4 - and a 'triradius' as a divergence of one ridge into 2 ridges in different directions (angle larger than 90 degrees up to 120 degrees). ... that is just a specified summary of elements that are mentioned in Schaumann & Alter's book. Penrose also described the requirement for a triradius to have angles that are all larger than 90 degrees. (Only the aspect of 'symmetry' vs. 'asymmetry' is not mentioned in Schaumann & Alter, not sure about Penrose's work - sorry, I can not specify for that aspect where I have seen it... but that detail is not important regarding the point I tried to make in that post). Lynn, can I first ask a question in return? I assume that you are aware of the rule that Penrose described for a 'triradius', that it requires to have angles larger than 90 degrees. But if that requirement is not met, how would you then name that ridge-element? Martijn (admin) wrote: Lynn, can I first ask a question in return? haha, I'm surprised you didn't go when posing that question! My answer is, it could be a bifurcation, or it could be an abutment. The onset of cellular proliferation which begins primary ridge formation occurs first in three distinct areas: (1) the apex of the volar pad (which corresponds with the core of the fingerprint pattern), (2) the distal periphery, or tip of the finger (near the nail bed), and (3) the distal interphalangeal flexion crease area, below the delta(s) in a fingerprint. As ridge formation continues, new proliferation occurs on the edges of the existing ridge fields, in areas that do not yet display primary ridge formation. 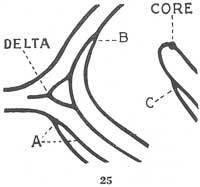 These three "fields" of ridges converge as they form, meeting in the delta area of the finger (Figure 19). This wave-like process of three converging fields allows for the visualization of how deltas most likely form (Figure 20). "Patti, can you find any quote in any work which explicitely describes that a 'triradius' can been seen as an abutting of three individual rigdes?" 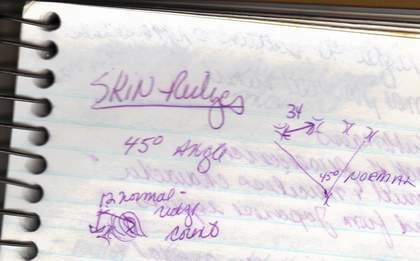 In the text Patti posted above, it says "One of the more common types of construction....<snip> .......Three ridges radiate from a common point". I know it says 'radiate', but it also says that all triradii are associated with abutment of 3 ridge systems coursing in different directions. So presumably these three ridges are abutting. First of all, on page 58 we can read how Cummins & Midlo's only ASSOCIATE... triradii with the (surrounding) presence of 3 individual 'ridge systems'. And you can visualize that each 'ridge system' (Penrose talks about parallel ridge fields) is composed by multiple ridges in a topographic zone - as is seen in each of the examples in figure 47 (and also in Penrose figure 4E,F,G + Schaumann & Alter's 6 examples in figure 3.5). Therefore, the word 'ridge system' does not relate to an individual ridge, nor a radiant of the triradius. Because each radiant actually forms the border between two 'ridge systems'. When would you call it a 'bifurcation'? And when would you call it an 'abutment'? Posting w/o reading last postings first - I've been searching the internet. In trying to find additional support written in a way that leaves no question (hahaha) I found the above link. Page 20 of 21 (22 of 24) shows an illustration for merkel cells! Remember discussing those about a decade ago!? These cells appear first in groups shaped like a hexagon. 6 sided grouping. Then they connect to each other in rows. Although it doesn't explain bifurcations and abutting ridges, it gives a visual of the non-linear beginnings of ridge formation. It is suggested that the tensions from the topography cause the lining up in parallel rows. Without the tension we might end up with fingerprints that look more like the texture of muzzles. This concept of vertical, lateral and proximal tensions help show why it's not common for ridges to form wide bifurcations except at junctions like a meeting of fields or triradial areas. You may be correct in saying that a bifurcation can split higher than 45 degrees, but at what point/degree do you see it as no longer splitting but abutting? Though only in the F.B.I. approach an 'abuting ridge' is defined very well: because the F.B.I. solely speaks about an 'abutting ridge/appendage' when two ridges make a right angle. but I'm not sure that is correct(?). They talk about "IF" an appendage abuts at 90 degrees, it spoils a recurve, but do they specifically say that all abutting ridges are a right angle? Penrose mentions the triangular enclosure and the 3 ridges meeting. "From the central point of a triradius...or even...a trianglular enclosure." "From the central point of a triradius...a ridge junction...three radiant ridges can be theoretically traced." "If the angle between two of these radiants is less than 90 degrees no triradius is deemed to exist"
It also takes me back to my original teachings about triradius being the vaguely triangular shaped area where the 3 ridge fields converge (which we are now talking about as being the 'triradial area'). If you look at fig 18 on P 202 of this pdf, this gives you an idea of how he colours the triradius in black. (he refers to this black area as 'triradius' in the paper I have quoted above). Actually.... ....I wonder if we are wasting our time in all this discussion about triradii ? As FBI don't use the term 'triradius', it might be more useful to talk about 'triradial area' and of course the 'triradial point' - which is talked about both in the scientific system and the FBI system as their delta. However.... it has occured to me that the FBI delta is not always in the same position as the scientific 'triradial point'. !!! Also one thing we haven't mentioned so far is the "singularity", which term is used in forensic fingerprint identification - the 2 singularities being the delta (or triradial point) and the core. So...why didn't I clean my house today, or prepare tomorrow night's palmistry lesson, or finish designing the leaflets for the forthcoming fair?... cos I was too busy doing the geeky fingerprint stuff !! I am starting to fear that the 3 of us have some as-yet unknown mental illness, called something like 'dermatoglyphicus obsessivus compulsivus'. Lynn, I can assure you that the F.B.I. is only talking about 'abutting ridges' when the right angle rules applies. And since there is no reason to assume that the F.B.I. is using other rules then the ones described in the book... logical deduction can only lead to the conclusion that they assocation an 'abutting ridges' with 2 ridges that make a right angle. By the way, this F.B.I. 'choice' makes sense! Because IF one starts describing ridges that make an angle significantly lower than 90 degrees, then one creates a problematic situation... because where to draw the line where an 'abutting ridge' becomes a 'bifurcation'? A 'bifurcation' (unless there is a clear indication that one could speak of 'abutting ridges'). 2) so how does this differ from my original idea about a triradius? (which I now concede we can refer to as 'triradial area) - 3 innermost ridges of (that form the border between) 3 ridge systems. ?? Patti wrote: In earlier discussions you argued that a system or a field was related to 1 ridge and the groove on each side. Have you now decided it is more than 1 ridge? Lynn wrote: So...why didn't I clean my house today, or prepare tomorrow night's palmistry lesson, or finish designing the leaflets for the forthcoming fair?... cos I was too busy doing the geeky fingerprint stuff !! I am starting to fear that the 3 of us have some as-yet unknown mental illness, called something like 'dermatoglyphicus obsessivus compulsivus'. If the appending ridge flows off the looping ridge smoothly in such a way that it forms a bifurcation and not an abutment of two ridges at a right angle, the recurve is considered as remaining intact. The test is to trace the looping ridge toward the appendage, and if, when it is reached, the tracing may be continued as readily upon the appendage as upon the looping ridge, with no sudden, sharp change of direction, the recurve is sufficient. Figures 161 to 184 should be studied with this in mind. ...and if it's less than 90 degrees it's not a triradius. Thank you for this link to the paper by Wilder! I did not have it! It does look like he was seeing the same shape(s) as I do! Personally, I think the word triradius means and is used as - 3 ridges that radiate. I think the triradial area is the place where these 3 ridges from 3 different fields meet. Triradial point is the center of the 3 meeting ridges. There is only one place that the FBI location of the delta is different than the methods by Penrose etal. That is when there is no dot, just empty space, like the 3 corners meeting triangle > FBI - you move to the wall of the pattern area. >Science - you stay in the empty center of the trianglular space. What do you mean by 'singularity'? Patti wrote: Thank you for this link to the paper by Wilder! I did not have it! and the same shape that I was originally taught about triradius! Lynn wrote: However.... it has occured to me that the FBI delta is not always in the same position as the scientific 'triradial point'. !!! Patti wrote: "Personally, I think the word triradius means and is used as - 3 ridges that radiate. Singularity - I lost the quotes, but forensic systems talk about singularity as being two specific points - the triradial point or (FBI) delta, AND the core. "Figure 25 shows ridge A bifurcating from the lower type line inside the pattern area. Bifurcations are also present within this pattern at points B and C. The bifurcation at the point marked "delta" is the only one which fulfills all conditions necessary for its location." Lynn, do you now understand... ? re "which implicates that they describe any 'triradius' as a bifurcation." but the FBI do not describe triradii at all! Yes in this example, FBI place the delta at the point where the ridge bifurcates. 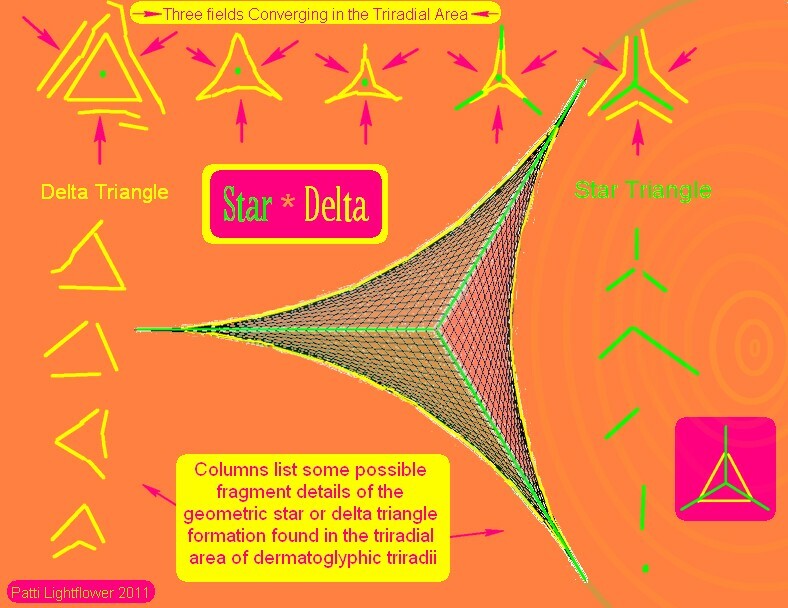 But from C&M perspective, the 'delta' is the small triangular shape where the 3 ridge fields join, and the triradial point would be in its centre. i.e in this example, FBI place the delta at the point where the ridge bifurcates. 3a - 'Hook' (Galton, 1895), defined as: ?? 4d - 'Triradius' (Craig A Coppock, 2007), defined as: "An intersection of seperate ridges often found in the delta areas. A triradius is similar in appearance to a bifurcation yet, with a greater angle between the seperate ridge intersections.". "A bifurcation is the forking or dividing of one line into two or more branches." - Firstly, the definition of a 'bifurcation' is positioned in the F.B.I. book at a very prominent place: it directly follows after the definition of the 'pattern area' and the 'type lines'. - Secondly, in the F.B.I. 's approach the 'bifurcation' became explicitely a multi-concept - where various specifications became irrelevant (such as: a - the angles between the ridges, b - the issue of whether ridges continue as parallel ridges or in a different direction, and c - whether the bifurcating ridges include no, one or more ridges... and even their direction became irrelevant). - And finally, because in this F.B.I. system the focuss became on the element of a 'bifurcation', the other elements from the older vocabulary were no longer required to be used (the older elements include e.g. the words: 'closure', 'fork', 'hook', 'spur' and 'triradius'). Lynn, I think I have spend my time well tonight... and I hope this will help you finally to recognize my point regarding the importance of the 'bifurcation'. Perhaps singularity means 1 core and 1 triradial point. Both are focal points. Fig. 25. Yes, I agree it's not on the wall of the pattern. In fig. 25, the location is the 'bifurcation' that the FBI chooses. I would see it as the triangular triradius and the FBI delta is located on the marginal angle. This sample also shows how the radiants would flow inside the FBI type lines. I think the FBI rules are not as much about finding the absolute 'triradial point' but the location to mark for ridge counting purposes. The delta is never counted in the ridge count in the FBI method and the radiants are not counted in the science method.